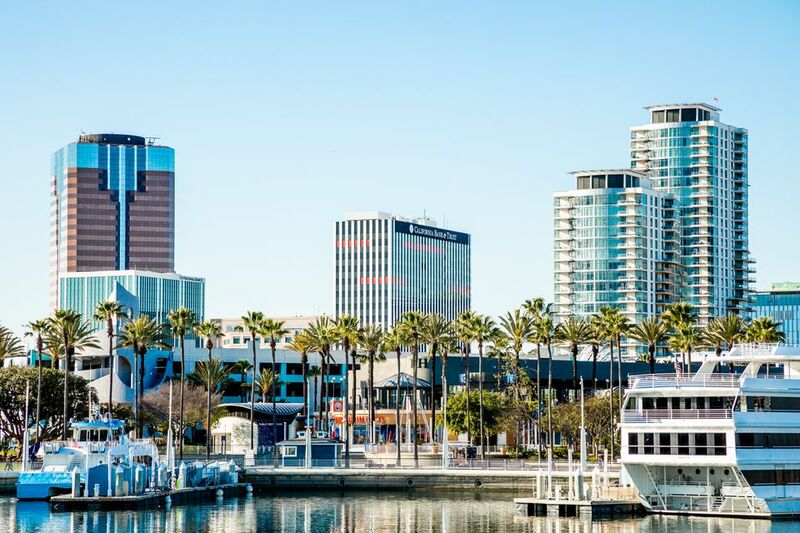 Often overlooked as a tourist destination, Long Beach offers a central location for exploring other parts of the Los Angeles area. It's close to major freeways and also has some nice attractions of its own. You can plan your Long Beach day trip or weekend getaway using the resources below. Like most California coastal places, Long Beach gets its best weather in spring and fall. During summer, the all-day, onshore marine layer that locals call "June Gloom" can keep your days gray and misty, but you'll see less of that here than in other Los Angeles beach towns. Our readers say the Aquarium of the Pacific is California's best. As Southern California's largest aquarium it focuses on the Pacific shore of North America and the tropical South Pacific. It's a fun place for kids of any age and adults too, with lots of interactive exhibits and touching pools. For an extra fee, you can enjoy special animal interaction experiences and behind the scenes tours. The Queen Mary is also a well-known Long Beach attraction. Some visitors still like it, but in my opinion, the visitor experience has taken a turn for the worse. It may be worth a visit if you have a specific interest. Otherwise, you may enjoy doing something else instead. Also, it's probably not something young children find interesting. Find out more in the Queen Mary visitor guide. Art Walk: The East Village Arts District (bounded by Ocean Blvd, Long Beach Blvd, 6th St. and Alamitos Ave.) offers galleries, art walks, free events and a First Fridays street fair. We also like the Museum of Latin American Art (628 Alamitos Ave), a contemporary art museum (works since 1945) perhaps best described as displaying contemporary works that happen to come from Latin America and reflect the culture they were created in. Shopping: You'll find lots of interesting local shops and boutiques in Belmont Shore (a couple of miles south and easy to reach using local buses), or browse for vintage clothing and furnishing on 4th Street's Retro Row (4th between Cherry and Junipero). The third Sunday of Every Month, the Long Beach Antiques and Collectible Market is one of the area's best. Naples Gondola Ride: Friendly gondoliers and charming houses lining hidden canals make for a perfect ride. They cruise from mid-day to almost midnight, but sunset is especially pretty and popular. If you're looking for a place to propose marriage, you could do worse: their acceptance record is near-perfect. Almost every Long Beach native will suggest a gondola ride during your trip. Nightlife: Long Beach is a popular nightlife center with a range of clubs and performance venues to choose from. For an evening drink with a view, try the Sky Room at The Breakers or the Observation Bar at the Queen Mary, which has an outdoor dining and viewing area where you can step out and see the coastal views of Southern California. Run Around: Take a Segway tour or rent one at Long Beach Segway Tours for a spin around the shoreline. For a quiet cruise around the Naples canals, pack a picnic and rent an electric Duffy Boat from London Boat Rentals. It seems like there's always something going on in Long Beach. These are the busiest events, ones which are popular and will require some planning for, but you'll find plenty more at the visitor's bureau website. Summer: You can find lots of summer concerts to attend in this guide. December: The uber-old-fashioned Belmont Shore Christmas Parade takes place the first weekend in December, followed by the Naples Boat Parade the following weekend. Long Beach is very busy during the annual Toyota Grand Prix (April). Either plan ahead if you want to go or plan around it if you don't. If you need help downtown, look for a Downtown Guide wearing a red jacket. They can help you find whatever you need. If you're around such popular destinations as the Aquarium or the Queen Mary, take advantage of Long Beach Transit's free shuttle bus that makes several stops around the Long Beach area. The easy way to find it is through Google Maps, which will show you the nearest stop. Just look for the word Passport in the route description. Our favorite place to stay in Long Beach is the Varden Hotel, a privately-owned boutique hotel with lots of personality - and exceptional customer focus. Hotel Maya is also a fun retreat that blend's Southern California culture with its Latin American influence, but its location across the water from downtown makes it slightly less convenient. For help getting the best possible deal, read about how to find a good place to stay cheap or go straight to Tripadvisor's guest reviews and price comparisons on hotels in Long Beach. Long Beach is right in the middle of the Los Angeles metro coast. If you live in LA, forget the freeway - take the Metro instead. Long Beach is 106 miles from San Diego, 137 from Bakersfield, 244 from Fresno. The nearest airport is the Long Beach Airport (LGB). If you choose a hotel in downtown Long Beach, it's easy enough to leave the vehicle behind. You'll have plenty of transportation options which can get you to any of the places we mention above. Passport buses are free within downtown and very affordable to go elsewhere. You can take the Aquabus from downtown to the Aquarium of the Pacific, Queen Mary, Shoreline Village, and Pine Avenue Circle. And the Aqualink takes you to Alamitos Bay and Naples.